This Apple Pie Smoothie Recipe is the ultimate healthy drink recipe for fall – ideal for breakfast, a snack or dessert! We went apple picking a couple weeks ago and still seem to be up to our knees in apples! Don’t get me wrong, I’m not complaining. Fall is the best time of year and local Michigan apples are just one reason why I love October so much. Since apples are in season right now, I love using them to naturally sweeten our morning smoothie recipes without relying on honey. For this apple pie inspired protein smoothie recipe I used oats to thicken the drink and plenty of warm spices including cinnamon, nutmeg and cloves. 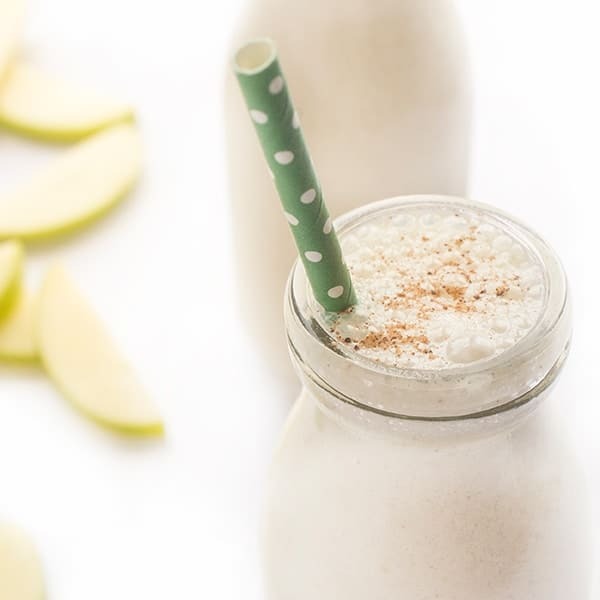 With over 23 grams of protein and close to 15 grams of fiber per serving, this apple pie smoothie is one fall recipe you can feel good about enjoying every single day! This Apple Pie Smoothie Recipe is the ultimate healthy drink recipe for fall - ideal for breakfast, a snack or dessert! Place all ingredients in a high speed blender and puree until smooth. Add more ice for a thicker consistency. Pour into two tall glasses to serve. 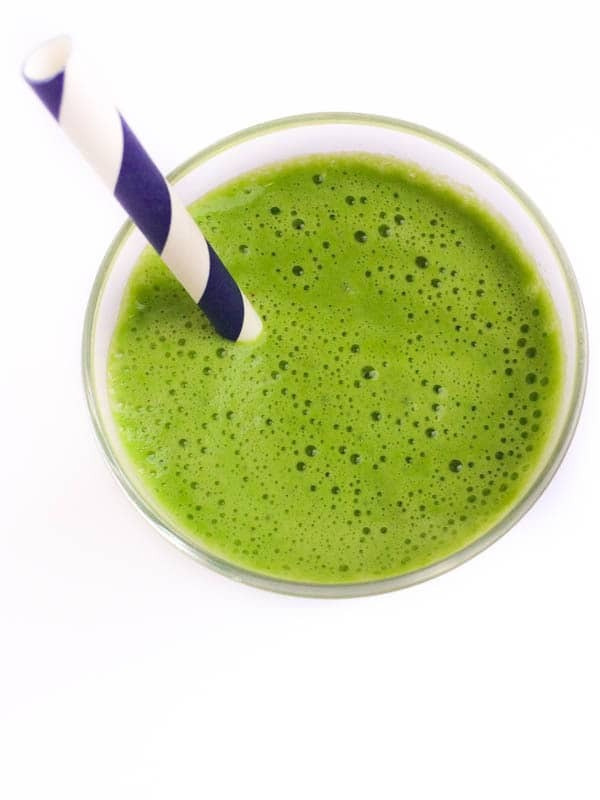 Curious about other drink recipes? Click on my Pinterest board to see more! The best drink I’ve ever had!! The flavors make the taste stand out!! LOVE IT!! :D (This from my nine year old daughter). Really tasty and full of nutrition. Oh I’m so glad you enjoyed it Sherrie!! I just came back from an apple orchard and picked up many apples. Let’s try this smoothie tomorrow. It’s looking so wonderful, Liz. I have a bag of freshly picked apples that I don’t want to spoil so I will be trying this for sure this weekend! I have been searching for healthy variations to the traditional apple pies and apple deserts (not that I don’t LOVE a good apple pie;). Thank you fellow Michigander for this wonderful alternative! Let me know what you think!! I hope you love it! Hello Michigan ! This is perfect for an office break ! Thank you ! YES!! Michigan at its best! Last year I was making a warm apple pie smoothie for cooler weather, but I’m definitely going to have to try this one. It’s very different from what I’ve done before. Let me know what you think!! I really loved it! I did try this, and neglected to put ice in. Oops! I will definitely use it next time, because accidentally warm smoothies are not pleasant. I also need to change up the spices somewhat – I used half the amount of nutmeg, which was still too much, and subbed a pinch of allspice for the cloves, which neither of us can tolerate the flavor of. I’ll reduce the nutmeg further when I make this next time. Once I get the spice levels to fit our tastebuds, this will be a definite keeper. I’m also sure that the spice levels work better when the smoothie is cold.